0.500" (12.7mm) OD x 0.250" (6.35mm) ID x 0.250" (6.35mm) thick, SmCo26 Rare Earth Samarium Cobalt Ring Magnet, Magnetized through the thickness, not plated. Rare Earth Samarium Cobalt Ring Magnets can operate in high temperature environments, or in an application where a demagnetizing force is present. Samarium Cobalt Magnets are typically used in high temperature motors, aerospace and military applications. Ring Magnets can be custom manufactured in different ways so that they can be magnetized in a specific direction. Below is an overview of the different direction of magnetization options, however, the direction of magnetization can only be set during the manufacturing process and cannot be changed once the magnet is made. Through the Thickness: Ring magnets where a magnetic field travels from the ID of the ring magnet to the OD of the ring magnet. Through the Diameter: Ring magnets where a magnetic field flows from the OD of the “north pole” to the OD of the “south pole”. The ID of the ring magnet will have a magnetic field that is straight and crosses uniformly across the ID. 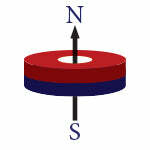 Radially Magnetized: Radially magnetized ring magnets have the magnetic poles on the OD / ID instead of the face. Radial magnets are made as a single piece or in multiple pieces depending upon the size of the magnet. A list of radial rings is available under our Radial Ring magnet section. Multi-Pole Magnetization on the Face: If a ring magnet is large enough it can be magnetized with multiple poles on the face in a North / South configuration. An example of a multi-pole ring is our part number R1050. For a list of neodymium magnet materials and their characteristics, visit our Neodymium Magnet Table section. Use care and caution when handling neodymium magnets, as outlined in our Magnet Safety section.